Our lower control arms are the heaviest duty units on the market today. Uni-body Jeep’s tend to transfer more road noise or suspension noise than do Jeep’s with frames. We use the factory OEM bushing at both ends of our control arms to reduce those annoying noises. These control arms twist or rotate while driving allowing the axle to flex easily. With over 3 inches of adjustment, adjusting the length is as simple as removing one end and rotating the body or shaft to the desired length. Thread strength can be thought of like axle spline strength, the more axle splines there are the stronger the axle is. We use eighteen threads per inch on our lower control arms, not "acme” threads (typically five threads per inch) that tend to be weak and have very little fine-tune ability. The adjusting shaft rides on a brass bushing and is then sealed to keep out dirt. Each unit is then filled with grease to help keep out all moisture and maintain the threads. Black powder coating and zinc plating are standard. Arms will adjust one full inch shorter than OEM arms and extend 2¼" longer than stock arms. 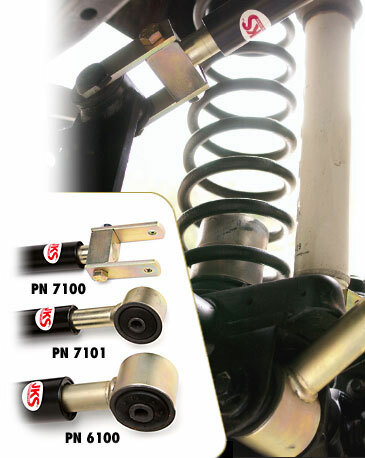 Rear pinion angle is easily adjusted using shorter than stock arms. For use with any lift kit. Adjusting shaft rides on an inner brass bearing. Adjusting shaft is 1¼" in diameter. Units are sealed using a spring-loaded crankshaft style seal. WJ owners will need to use shims or washers on either side of the OEM rubber bushing when attaching to the axle. Arms are greasable and come pre-greased.